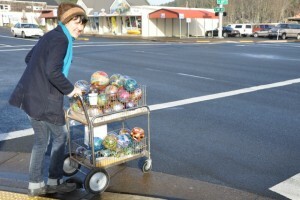 LINCOLN CITY, Ore. – When you buy and blow your own glass float, paperweight or starfish at the Jennifer L. Sears Glass Art Studio in Lincoln City, the chances are good that you will encounter glass artist Kelly Howard. 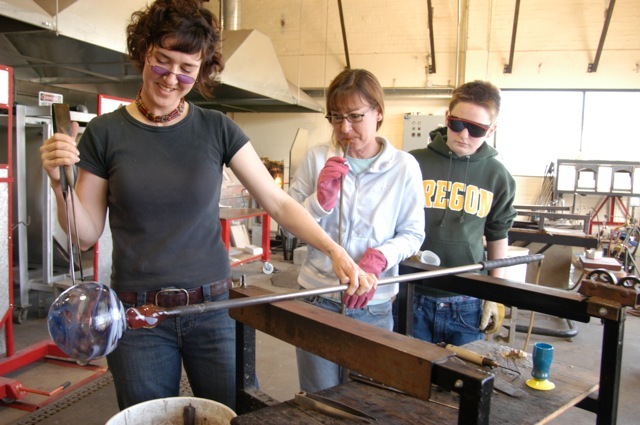 Kelly and her team of artists in residence are there five days a week in the winter and seven in the summer giving one-on-one help to any child or adult who wants to make and take home their own one-of-a-kind blown glass creation. Since it officially opened in February 2005, the first visitor-centered, hands-on studio of its kind has seen more than 250,000 men, women and children come through the door. Kelly, who was born and raised an hour west of Chicago, grew up painting and drawing and made many projects in her father’s industrial design workshop on weekends. In 1990, she enrolled and spent a year at the School of the Art Institute of Chicago. She transferred to the University of Wisconsin at Madison and earned a Bachelors of Art degree in psychology in 1994. While at the U of W, she spent a semester traveling to Italy and Venice, and after graduation she accepted a presidential merit scholarship to SAIC to study painting, drawing, fiber arts and bronze casting. The turning point to her future as a glass artist however, came the summer she enrolled in her first glass-blowing class. 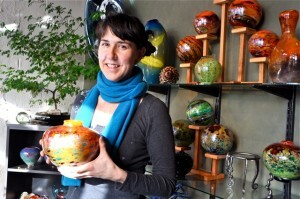 Kelly, who contracts with the City of Lincoln City to teach glass blowing to locals and visitors, makes about 16 to 20 pieces a day to sell in her gallery located across the street from the glass studio. In the winter when the studio is open Wednesdays through Sundays, she works Mondays and Tuesdays creating her signature glass art. During the hectic summer months, she does her work in the early morning before the studio opens to the public. 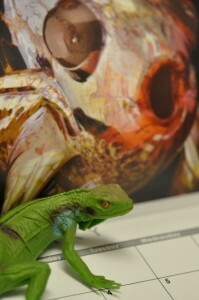 Earning a reputation for her beautiful use of color and form, Kelly is now enjoying widespread attention for her art. This past summer a glass collecting German couple who had also visited the famous Murano glassmakers in Venice, included Lincoln City in their travel itinerary so they could add a few pieces of Kelly’s glass to their collection. For more information on the Jennifer L. Sears Glass Art Studio, visit 4821 SW Highway 101, Lincoln City, www.jennifersearsglassart.com , http://www.oregoncoast.org or call 541-996-2569.